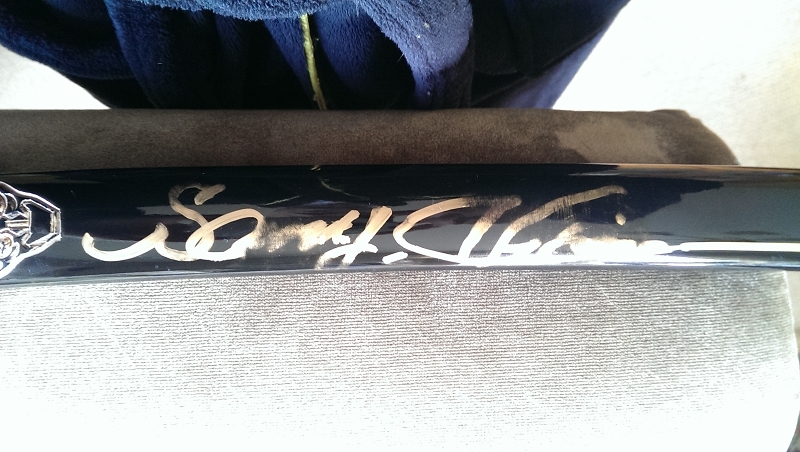 Here is our Hanzo Steel Katana HAND signed by Sonny Chiba himself. Only 106 pieces. Most of these have signatures that are slightly smudged. No refunds. All sales final. Sold as is. This is a fully functional Kill Bill Replica battle ready katana sword ready for action. The video below shows someone slamming it into a piece of tree trunk very hard and slicing off the edges of the trunk. As you can see the steel does not bend. This is a very sharpened sword so if you purchase one, please be careful. 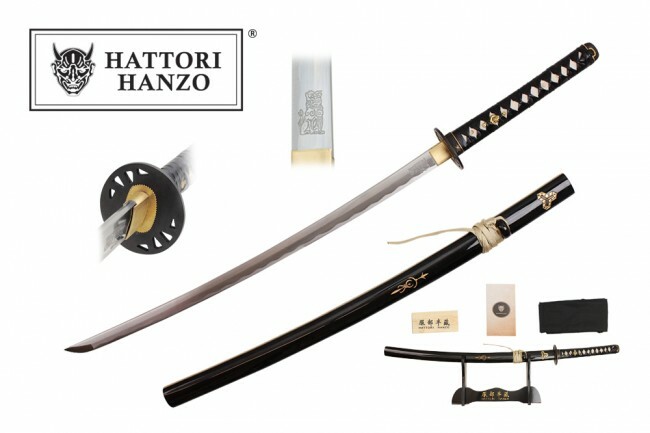 Comes with a Protective Cover Bag, a Maintenance Kit with Hattori Hanzo in Japanese, and a FREE Lacquered Finish Stand. Swords will probably come to you with a light oil or a heavy coat of grease and wax to protect the blades during transcontinental transport. To remove the grease or wax you may use a solvent such as lacquer thinner or mineral spirits. Once you have finished this, apply your light coat of oil or a silicone spray. You can also wipe it with a silicone coated gun/reel cloth. In many respects, the gun/reel cloth is preferred as there is less tendency for dust to accumulate and trap oxygen to cause pitted areas in the blade. Blade lengths are approximately 29" long. These blades are made of HRC1045 high carbon steel in the popular Shinogi Zukuri style. 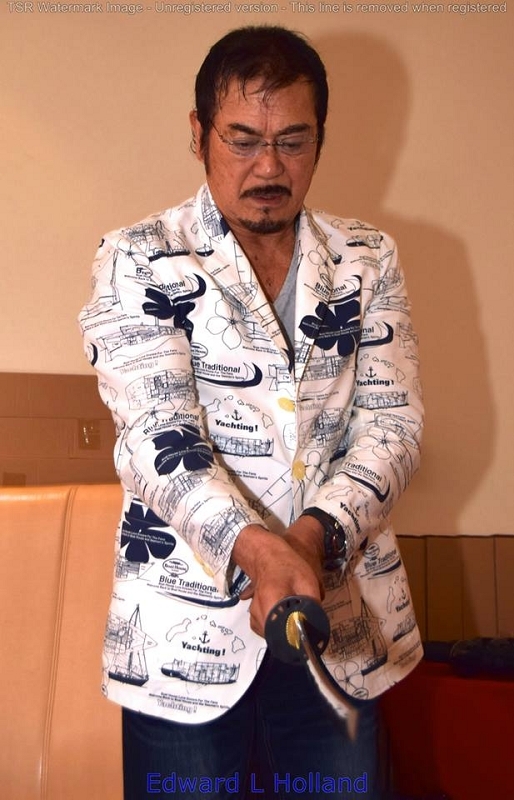 The famous Kill Bill Emblems are ENGRAVED on blade. The Tsuka (handle) is made with genuine Ray Skin and is wrapped in black leather (PVC) braid measures 11” long. There are two gold sycamore ornaments attached on either side of the Fuchi (collar) and the Kashira (buttcap at the end of handle). These buke-zukuri style katana swords have a black Tsuba (guard) that is the same style as in the movie. The Saya's (scabbards) are made of wood with black lacquer finishes. They measure 31” long. The body of the scabbards bear the identical three-leaf sycamore emblem as seen in the movie. The Kurikata's (knobs) are wrapped with cords which are used to suspend the katana sword by your waist. Please note that the Sageo's (cord's) will vary in color, from tan, black, and silver. We cannot accommodate requests on the sageo color. Thank you. **Sword Cleaning Kit may vary from picture, but will always include everything you need.